The Knowledge Transfer feature of Pursuit highlights collaboration while having fun competing. Take your next corporate training or team building program to the sun, surf, and sandy beaches of Fort Lauderdale. “The Venice of America” will put everyone in a great mood and ready for adventure with its 23 miles of golden beaches and blue green water, open air dining and shopping along Las Olas Boulevard, and first-class resorts. 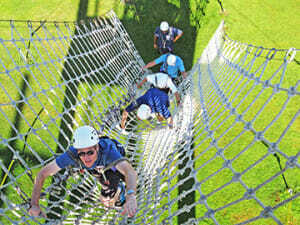 Under the sunny skies of Fort Lauderdale, we blend Low and High Ropes Course challenges like transporting your whole team through a rope web or belaying a partner as they ascend a tower of suspended vertical pipes. Our challenging ropes courses in and around Fort Lauderdale enable participants to grow on an individual level and as a team while integrating leadership and communication concepts, problem-solving, and coaching. Join us at the Galleria at Fort Lauderdale, or other retail locations, for our Play for the Kids scavenger hunt focusing on giving back to the community by purchasing items for kids in need. Team members have fun together while searching for specific items, collecting points along the way and participating in shopping challenges. If your event involves learning more about each other and your behaviors, try our DISC workshop at conference venues such as the beachside Atlantic Hotel and Spa or the Hilton Fort Lauderdale Marine.